Tech writing pays my bills, but creative writing feeds my soul. I've been a writer as long as I can remember. It's one of my passions in life. Lucky for me, it's also my job! I love dogs, photography, ice cream, Diet Coke and being a mom. My Thumb Is Not Green…Is Yours? A few months back the girls and I wandered Wal-Mart on a lonely Friday night. Every few moments one of them would point to some must-have object along the way and beg me to buy it for them. My head already ached and really I just wanted to go home and veg when we made our way from the cat food aisle past the gardening section. “Look, Mom! Seeds!” My oldest excitedly pointed in the direction of brightly packaged flower seed packages. The flowers on the fronts smiled at me and I thought, “why not?” Growing flowers from seeds could be fun and educational at the same time. We could plant the seeds, watch the grow and finally transplant them outside when it go warm enough. I imagined the girls and I admiring our beautiful wild flowers as we cut them into colorful bouquets. “OK!” I said. “Let’s pick out some flower seeds.” The girls squealed and giggled as they picked out various varieties of flowers: zinnias, daisies, pansies… I tried to read the backs to see what type of lighting requirements they required, but gave up as they excitedly tossed the packets into the cart. Next, I picked out a mini-greenhouse. It was only five bucks and included little dirt pods that you just added seeds and water to. Perfect. 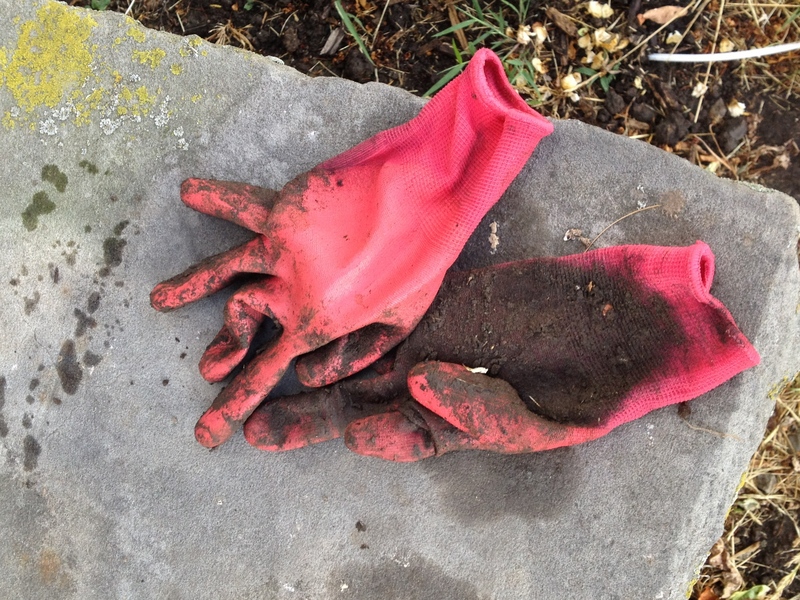 Finally, the girls picked out gardening gloves-blue for the oldest, a princess pair for the youngest and red for me. As we headed toward the check out, the oldest talked me into a watering can. We had everything we needed, except a green thumb, but more on that later. Later that evening, we poured the water over our dirt pods and the flat disks magically grew and grew. We had dirt everywhere, but the girls happily pushed their seeds into the dirt and spilled them on the dining room floor. Thirty minutes later our green house planted, the only thing left was to wait. We didn’t have to wait for long. Within three days, the seeds sprouted. Instead of the recommended two or three seeds per pod, some had six or seven. The youngest protested as I pulled the smallest sprouts and left the strongest. I’d already learned from past experience this process is a must. A several days later the oldest excitedly pointed out the sprouts were getting their cotyledons. 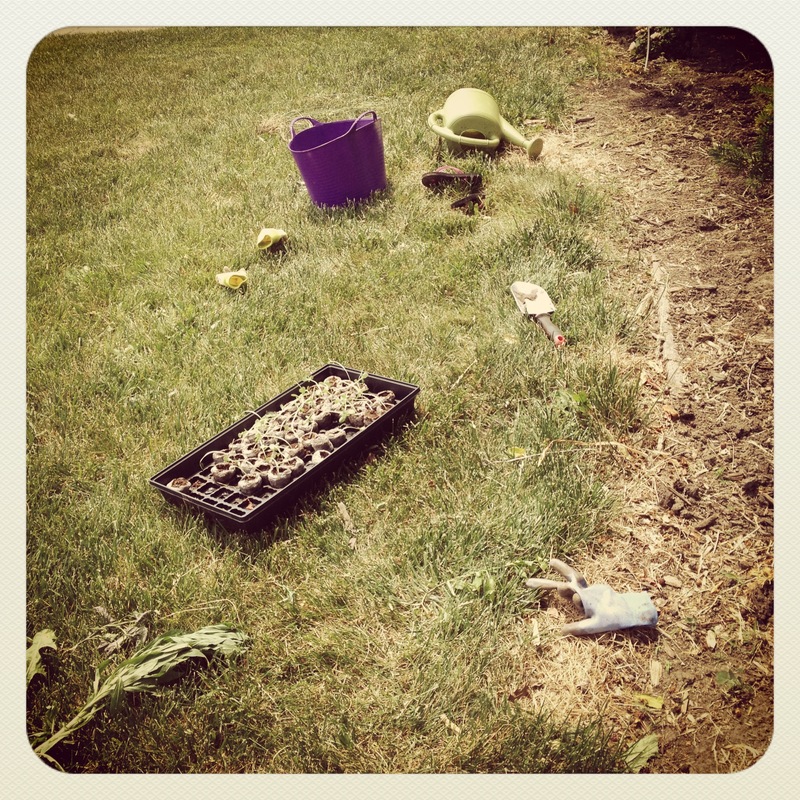 The weeks past and finally it was time to transplant our young seedlings outside in the flower bed. We pulled on our gloves and got out the rake-thingy and the little shovel. We dug and planted and dug and planted. Within ten minutes the girls lost interest and I dug and planted, dug and planted. Planting a flat of flowers was harder and took longer than I remembered. I wiped the sweat out my eyes with the back of my glove. “What’s that wet stuff on you, Mommy?” The youngest asked. ” Hard work,” I told her. Satisfied, with the tiny rows of flowers to-be, we packed up our flower planting tools to get a juice box. The next morning I woke a little early to water the fledgling flowers, only to find carnage. Tiny leafless stems, holes where plants once grew, if only briefly, remained where less than 24 hours before our little plants represented the hope of a beautiful cutting garden. A few weeks ago, I noticed the local greenhouse had flats of flowers on sale 50% off. Not, one to give up, the girls and I picked out some beautiful petunias, begonias and other flowers I do not know the name of. The girls excitedly pulled their gardening gloves back on to help me replant. I started to dig, or rather, chisel a small hole in the ground. Rock-hard from lack of precipitation, the ground did not budge beneath my shovel. 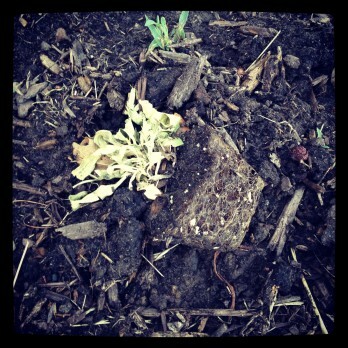 After what seemed like hours of futile digging I only had a shallow, dusty hole in which to place my wilting flowers. What we need, I thought, is some water. And so, I drug the house around to the front of the house a proceeded to turn our dusty dessert into a swampy mud pit. 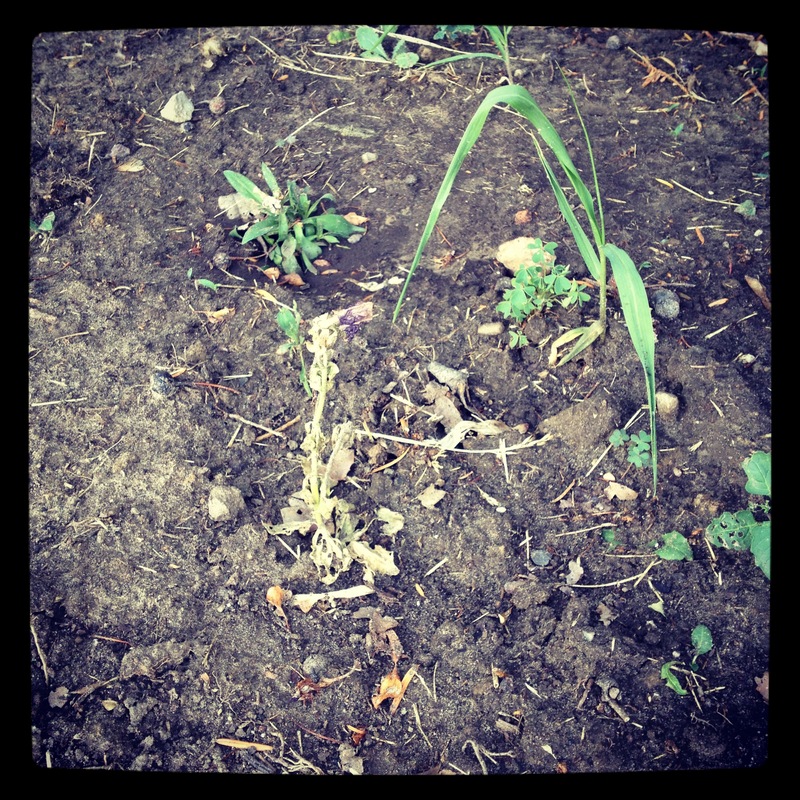 Not my brightest idea, but I was at least able to dig a hole deep enough to plant our flowers. Relieved each morning to see no sign of the marauders that destroyed our first attempt, we watered and weeded our little flower patch every evening. The girls took turns hosing down the flower beds and each other as unfortunately we saw no sign of rain in the near future either. Last weekend, we were out of town for the weekend and unable to water our flowers. The temperatures soared into the 90s and the sun baked our flowers a little too much. and on the other end our mysterious digging nemesis had up-ended several more. Big sigh… So what do you think? Three times a charm? Try, try again? Or hang up the gloves until next spring? Do you have a green thumb? What’s your secret? Posted on June 30, 2012 June 30, 2012 Categories humor, seasonsTags colorful bouquets, flowers, Garden, gardening, Home and Garden, kids, mini greenhouse, nature, planting, plants, rain, seeds, Sowing, water, Watering canLeave a comment on My Thumb Is Not Green…Is Yours?